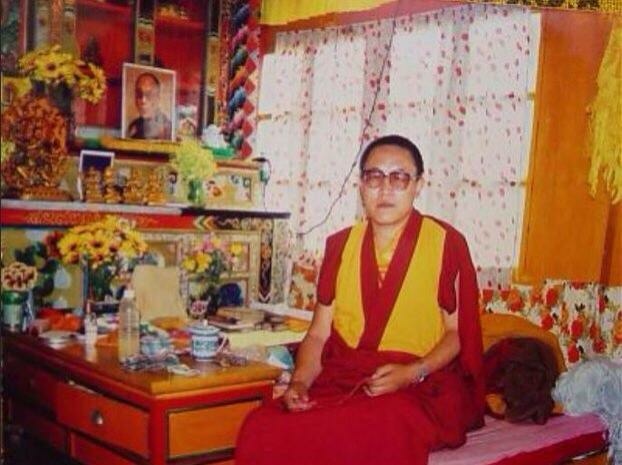 Tenzin Delek Rinpoche died under suspicious circumstances in a Chinese prison in Eastern Tibet earlier this week. His family shared this news with the rest of the world on Monday July 12, 2015. All over social media, I saw the heartbreaking reflections and memories from Tibetans and Tibet supporters all over the world. I could feel the pain, anger and frustration in their writings, videos and photos. For those who do not know his story, Tenzin Delek Rinpoche was a highly respected Rinpoche (high lama) from Lithang, Kham in Tibet. He was widely recognized for his role in the community as a leader who worked to develop social, medical, educational, and religious institutions for Tibetan nomads in the area, as an advocate for environmental conservation, and as a mediator between Tibetans and Chinese. Tenzin Delek Rinpoche’s strong influence in his community and his efforts to preserve Tibetan identity caused the Chinese authorities to view him as an enemy and as a threat to their control in the region. Over the course of a decade, he was the target of harassment and intimidation by Chinese officials. He spent more than 13 years in prison and was framed by the Chinese government because of his community work. He died as an innocent man who suffered more than 13 years in a Chinese prison for his vision, concern, and hopes for Tibet and the Tibetan people. Source: A transcript of a recording of Tenzin Delek Rinpoche obtained from the detention center in Dartsedo on January 20, 2003. When I was in seventh grade I was running a Students for a Free Tibet (SFT) chapter at my middle school located in Howell, New Jersey. Tenzin Delek Rinpoche, the Drapchi 14 nuns and the Panchen Lama were the first political prisoners I ever learned about. As a student in a middle school I would host dances and bake sales at my school in efforts to raise money for SFT. At the time I was very fond of putting pictures and stickers on my school binders and I had one sticker of Tenzin Delek Rinpoche on there. His photo was surrounded by photos of my friends and family and my classmates would often ask me about him. During our school events I would put images of him on the walls. Students and faculty in my school started to recognize his face and know his name. Although I was the only Tibetan student in my school I was very lucky to have friends who would help me with the event planning of the dances and bake sales. I was the only one who would petition in my school because I was the only one who could really explain the story behind Tibet’s occupation and who these political prisoners were. Even though I was just a young awkward girl wearing colored braces and crooked glasses, born and raised in New Jersey, I was able to develop a strong connection to Tenzin Delek Rinpoche and wanted to do everything I could to help tell his story. When I found out that he had passed, I felt as if a close family member had passed away. Not only did he feel like a close family member, he was also a leader of Tibetan people who was murdered by the Chinese government. I felt frustrated and angry because his death could have been prevented. Tenzin Delek Rinpoche did not die naturally or by accident. He has been dying and slowly suffering for more than 13 years in a Chinese prison for a crime he did not commit. When he first entered prison he had no health problems. My heart aches to think about what he must have been subject to while in prison. May your legacy live on and inspire others for future generations. Your bravery and dedication to Tibet will never be forgotten. This is for you, beloved Tenzin Delek Rinpoche. Tsering Woeser, a prominent Tibetan activist, writer, poet, and a recipient of the U.S. State Department’s 2013 International Women of Courage Award shared her personal photos of Tenzin Delek Rinpoche on her Facebook this week. Her personal photos moved me to tears because she had not only lost someone she looked up to, she lost a friend. These pictures were taken in June 1999 at the time when I went to Nyagchu County, Kardze Tibetan Autonomous Prefecture in Sichuan Province, and met Tenzin Delek Rinpoche. Some photos were taken in the school for orphans run by Tenzin Delek Rinpoche. After he was arrested and sentenced, the school was closed down by the authorities, the children were all sent away, the school has now turned into a business run by Chinese migrants to the area and it is a pig and chicken slaughterhouse. Some of these photos that I took when I went to Tenzin Delek Rinpoche’s official residence in Nyagchu County. I met Tenzin Delek Rinpoche twice. The first time was in June 1999, when I got local friends to take me to to pay Rinpoche a visit. The second time was August 2001, Wang Lixiong and I were travelling through Nyagchu County, I took Wang Lixiong to pay Rinpoche a visit. After Tenzin Delek Rinpoche was arrested, Wang Lixiong later wrote in an article: “From 2000 to 2002, I went to Nyagchu County three years consecutively – the very County where the two Tibetans had been sentenced to death. I had known very early on of Tenzin Delek Rinpoche, furthermore I had personally witnessed his prestige amongst the ordinary Tibetan people of the southern part of Kardze Prefecture. He went to rural areas and spoke about Buddhism, he founded various charitable initiatives, he established a school for orphans, assisted the elderly, repaired roads and bridges, protected the environment, educated people on the dangers of smoking and drinking, prohibited gambling and killing. Many people quit their bad habits and started new lives, many even regarded him as a second parent. In 2001 I visited Tenzin Delek Rinpoche in Nyagchu County, and his own modest livelihood made a profound impression on me. Everything that was offered to him by the local people, he used for service to the public, the local people knew him well, nobody believed he was involved in any bombings and in fact they thought that the government was framing him. According to Students for a Free Tibet, right now over 100 Tibetans, including family and students of the late Tenzin Delek Rinpoche are peacefully protesting outside Chuandong Prison in Chengdu, demanding the return of his body amid armed police presence. Sources from inside Tibet are reporting news of escalating tension as prison authorities have notified family members that his body will not be returned. You can send a message to Chinese authorities to release Tenzin Delek Rinpoche’s body to his family in order to carry out final Buddhist funeral rights. I understand that A’an Zhaxi (pronounced Ahn Ja-Shee), Tenzin Delek Rinpoche, died in custody in Chuan-dong Prison on July 12, 2015. A’an Zhaxi was an innocent Tibetan Buddhist leader. Release his body to his family immediately so that they can perform final religious rites. 1. 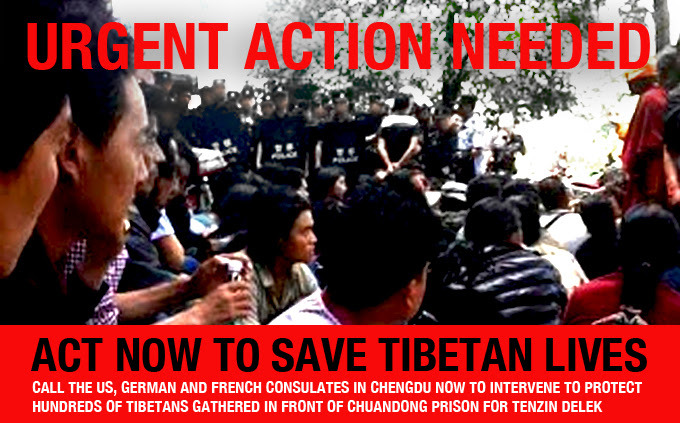 Over 100 Tibetans are currently holding a peaceful sit-in protest in front of the Chuandong prison in the Chinese city of Chengdu to demand the release of the body of Tibetan Buddhist monk Tenzin Delek Rinpoche in order to perform final Buddhist rites. 2. We are concerned about the safety of the Tibetan protesters. They are at a high risk of facing a violent response by the Chinese authorities. On Monday, several thousands of Tibetans in Nyagchuka county were shot at leaving 15 people critically injured and hospitalized. 3. I urge the Consulate General to directly intervene and monitor the situation in order to ensure the safety of the peaceful Tibetan protesters and strongly urge Chinese authorities to exercise restraint. You can also Take Action for Khenpo Kartse who is still serving a sentence in prison. Let’s make sure that not one more Tibetan political prisoner suffers the same fate as Tenzin Delek Rinpoche.